The piece is in 4/4 time, so I count 4 1/2 beats in the treble clef and 5 beats in the bass clef. I'm not sure if I've just miscounted the beats in the treble and bass clef a million times or if there's such a thing as an unwritten polyrhythm or what. Maybe the leggiero has something to do with it? Here's how I'd interpret it. Excuse my lack of drawing skill. There are four beats in the right hand, each a crotchet in length. I've drawn lines between each beat to make them clear. The left hand seems to be using quintuplets, but they've omitted the little "5" you'd normally expect. So yes, it is a polyrhythm; 5 against 4. I've seen omitted markings with triplets, but not more complicated tuplets, so I may be wrong. Leggiero means light, delicate. So that's an expression indicator, and doesn't govern rhythm. I would not call this a polyrhythm. Technically, it is one. Practically, the LH is playing slow arpeggios. 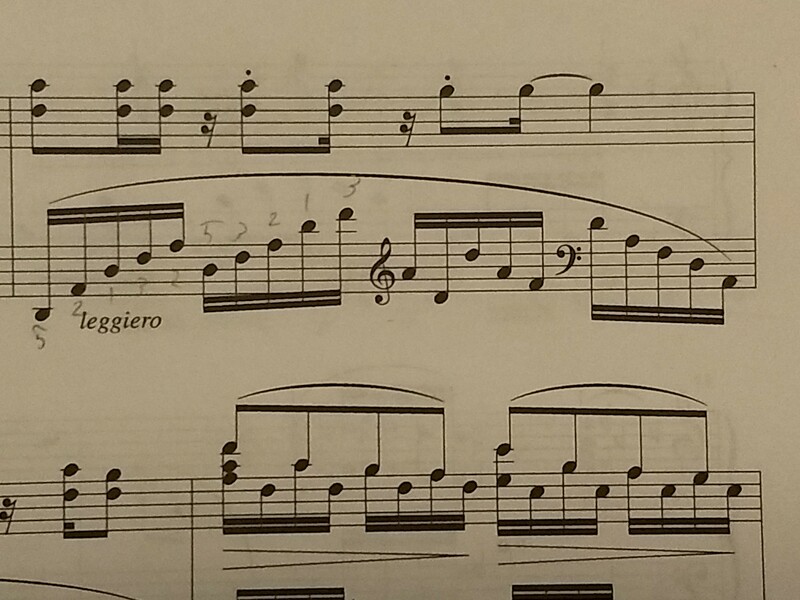 In places like this, the rhythmical precision is with the right hand, whereas the left hand can be a bit sloppy. So if I played this, I would make sure my right hand is timed precisely, and the left hand plays the first note in each beat at the very correct time, maybe even slightly louder than the rest (but just so slightly). As for the typesetting, the setter could have included the little 5s above/below each beam, but you quite often see these omitted in places like this. Another argument against polyrhythm in these measures is the measure 48, that shows a well-signed tuplet (12 notes). If the composer did mark that tuplet, there wouldn't be no reason to not mark tuplets on other measures, if on other measures the effect would be polyrhythmic. Leggiero resembles Chopin or Debussy expressions, which express polyrhythm by poetic means. For instance, in the beginning of Debussy's Préludes, book 1, prélude III (Le vent dans la plaine), there's the expression "aussi légèrement que possible", meaning "as light/delicate as possible". Debussy annotates the tuplet, but he's a man of XIX century: that was the practice. Today it's very common to annotate textures without marking tuplets explicitly, if what you want is not related to polyrhythm. This is a poorly written measure. There are, indeed, 20 sixteenth notes in the bass clef and 18 in the treble, so if considered a poly-rhythm it is 9 against 10, which is ridiculous. Without seeing the rest of the piece, I would assume these are unwritten quints, though that leaves the reader to guess where the extra two sixteen notes are to fit in the treble clef. Does anyone else dislike when people clap after you finish playing?